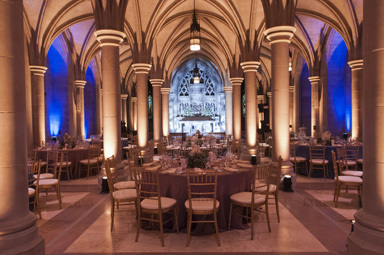 Imagine your next event in the beautiful setting of Washington National Cathedral. With unique spaces perfectly suited for your corporation or non-profit, treat guests to a breathtaking experience at an historic landmark and national treasure at one of the highest points in the District of Columbia. Washington National Cathedral, the 6th largest cathedral in the world built in 1907 and completed in 1990 is a spiritual resource for our nation: a great and beautiful edifice in the city of Washington, an indispensable ministry for people of all faiths and perspectives, and a sacred place for our country in times of celebration, crisis, and sorrow. 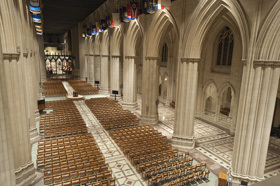 The Cathedral offers 4 distinct spaces to accommodate your guests in this iconic structure on the skyline of Washington, D.C. From gothic vaulting and stained glass windows to A/V facilities and spectacular vistas, reserve your space today in the Cathedral that has hosted the Dalai Lama, presidential prayer services, and world-class musicians. Site may not be used for personal occasions (e.g. wedding receptions), marketing, political or fundraising events. Hard liquor, beer, red and white wine allowed; no cash bar allowed. No open flame or fryers’ sterno allowed.